1 French defence, king's Indian attack, all chessmen on the board. White is at play. 2 From a Spasski tournament, after the 12th move. Ech player lost two prawns. White is at play. Match with postponed castling. Both players lost two prawns. 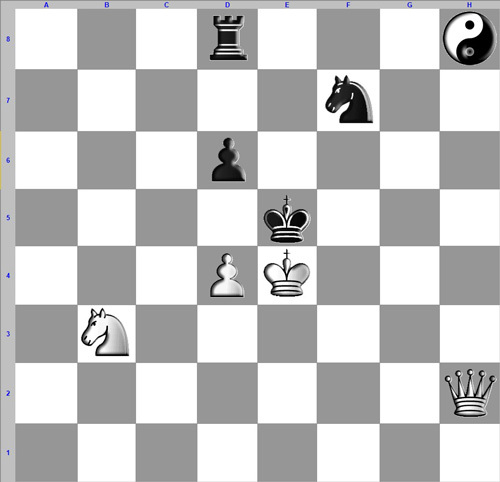 White lost a knight, black a bishop. Black is at play. Fantasy position, both lost a prawn and the queen. 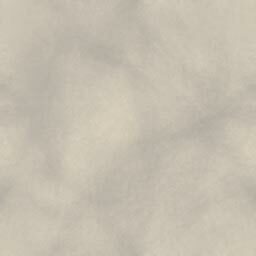 White starts. 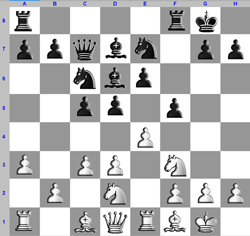 White has a complete set at the usual position. Black only has one piece, the king, which has the capacity of all chess pieces. So it has the capacity of queen and knight. Starting place is the king's place. If black plays good, he cannot be beated. A test to a beginner. Starts with an empty board, pieces before the board. With each turn the player selects a piece and any empty field to put it on. In the very same turn he continues with a move with one of his pieces already in the field (witch can be capture or check). Bringing in a piece is obliged (as well as moving) as long as there are pieces in store. So each turn has two moves, except the very first (at which one can only place on the board) and after all 16 pieces are in the game (where it becomes traditional chess). A prawn can only be placed on the the rowes 2 to 4. If one bishop stands on a white field, the other must be brought into game on a black field, and otherwise. Castling and special prawn movements don't exist, promotion stays as in traditional chess. Instead of the traditional starting positions, one starts from a more develloped position. Choose it from a book or internet, for example from a historical match or some opening, with equal chances. Exists for centuries, in Arabian chess it was called 'tabija'. Also a very unlikely position is possible, for example with prawns on the forelast row (see illustration). With each turn the player moves two pieces. Can also be capture. Check is only possible with second move. Winnar is the one who's king reaches first the last row. With capture the piece stays on board, but the one who strikes chooses an empty field to place it. The captured piece can also be the king. The prawn's double starting move stays, if it's position is on the second row (a prawn cannot be placed on the very first row after striking). Dito 'en passant'. Castling and promotion are lapsed. Similar to 'One against everyone', but black starts and has to bring himself with every move in check. White makes it undone. The first who does not succeed, looses the game. Needed: chess board with numbers, chess set, paper and stationary. Each player notes hiddenly on a sheet where he did put his mine before the game starts. That is the field where a piece cannot be captured, quite the contrary, the attaquer looses his striking piece. It can only be used once in a game. Two middle fields, one for each player, are hard shoulder places. White has d4, black e5, going on till the end of the game. (Also possible are e4 and d5.) The piece standing on such a field, is immune and powerless. So it cannot strike from that place and cannot be captured. Extra needs: flat disc, smaller then a field, to indicate the place on which a chessman can stand. If both players have a similar captured chessman, both are brought on board again. 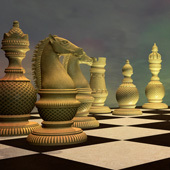 Each player places the chessman of the opponent on an empty field of his own choice (a prawn not on the very first or last row). Several games are invented, for example QuickChess from Joseph Miccio, on a board of 5 columns and 6 rows. From left to right are rook, bishop, queen, king and horse. Black is symmetrical. No double pawn moves, nor castling. Promotion restricted to captured chessmen. 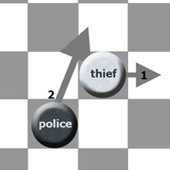 This game is played on a board with two discs: one presenting the thief, the other the police (black and white). First the thief places his disc on a field, followed by the police on another field of choice. Beside the board the police has one color set of chessmen, but the prawns of both colours. The thief can always do one single step in each direction. The thief writes on a paper (hidden to the opponent) to which field he is moving (one can for example draw a little arrow). Next the police must do a guess and moves his disc to the place he thinks the thief might be. 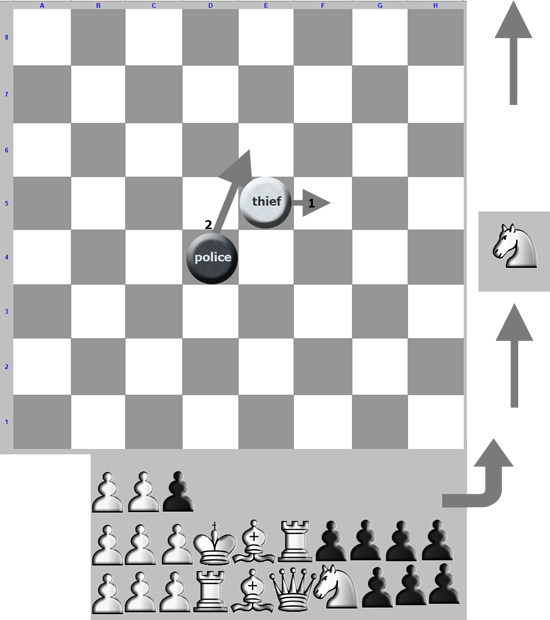 Each time the police moves, he must give one chess piece to the thief (it stays out of the board) which corresponds with the movement he has made. Next the thief reveals the place where he stands. If he has not be taken, he makes a next move. The thief wins when the police has given away all his chessmen and could not take the thief yet. The chessmen are replaced by numbers from one to sixteen (as on the image beside). 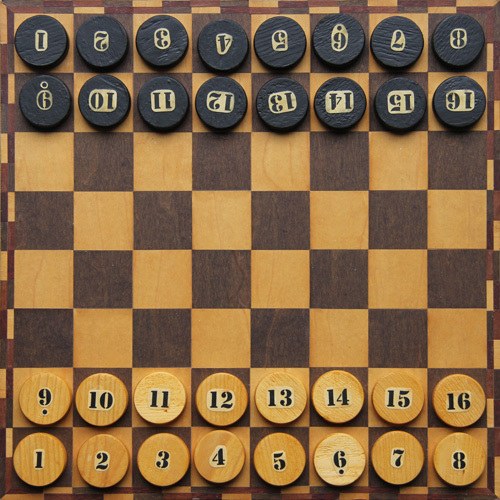 Both players write down on a paper (hidden to the opponent) which number corresponds with which chessman, until they both have a full and normal standard chess set. All pieces start on the first two rows, but of course in a self chosen position. 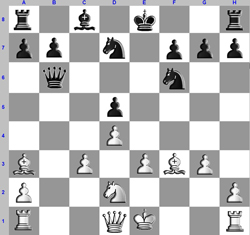 Both players can also write down after each move of the opponent, which chessman his number might possibly present. For instance a piece of the opponents second row moves two fields right ahead. So it can be a prawn, the queen or a rook. But on another occasion during the game the opponent makes another move with this same disc, one field in a diagonal direction. Now this number can only present the queen. When a disc is beaten, the disc is removed form the board and must reveal it's identity. The winner is the one who takes the king. As a start black puts a disc on one of the four central fields. 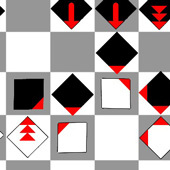 Rules are equal to traditional chess, but a piece can only do its move or take, when the disc, copying this move exactly, lands on an empty field of the chess board. That is the only function of the disc, used by both players. In the end game depicted beside, white is on turn. 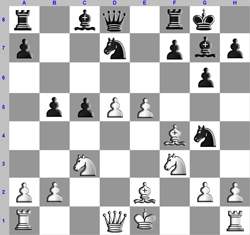 He cannot take the black king because the disc cannot move forwards. (The disc has been depicted as a yingyang symbol because it belongs to both colours.) The black king is not placed in check, it is quite useless to say "check" too. White can do a move with his king backwards, but he can also choose to bring his queen to f2, the following disc lands on f8. Black is now on turn but cannot take the white queen either. This is an amusing, but not an easy variant, and is played by those familiar to the traditional chess. 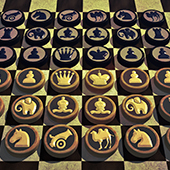 For each turn the player throws a dice which determines which kind of chessman he will use. To move with this piece is obliged. 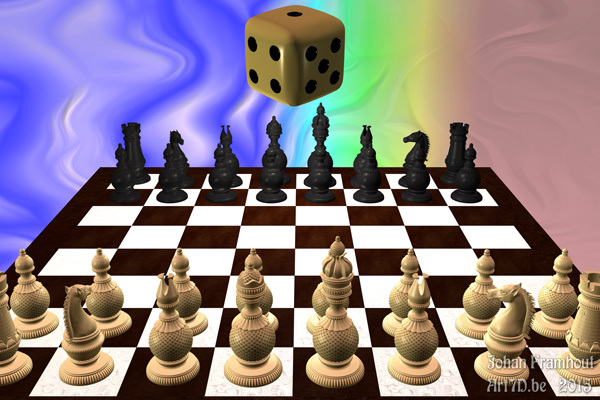 If no move is possible, the player throws the dice again, untill a suited number has been rolled. Castle is possible with both 4 or 6. This game is also suitable for solitary chess. In this you use both colour sets to play against each other. Because of the dice both colours get their own strategy. Variant 1: only one cast, if the casted chessman cannot do a move, one may choose witch chessman to move. With this variant the coincidence is large in the opening game and restricted in the end game. Variant 2: variant found on wikipedia, with two dices. The player can choose: one of the two numbers or the sum of both. With a double (2 same numbers) one can choose which chessman to move. If there is no suited number, the player looses it's turn. Castling can with 4 or a double. En passant exists. If a player is in check, he has to throw a suited number or he cannot move. So the king can be taken here. Rules: with capture one takes place on top of the captured man. They are carried off together with the chess symbol on top of the stack. When a double disk is captured, the same happens again. But if a threefold stack moves, the bottom disk is left behind. The colour of the left behind man is one's own and can be chosen to move in a next turn (if not captured). Materials: a usual set of chess, but with the chess symbols on disks. Add another chess figure on bottom of the men, except the king. For each piece which is not a pawn, a pawn is added. Each pawn gets a queen, this is meant for the promotion. 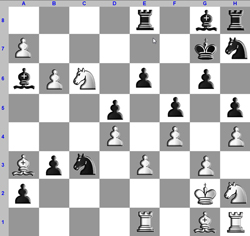 Rules: as usual chess, but when striking the disc is turned, except the pawns and the king. The attacker stays on top of the captured disc untill he makes a move. From that move on the captured (and turned) disc is free again to move. Promotion of pawns also happens by turning the man. Promotion is but the result of a pawn move from the forelast to the last row. 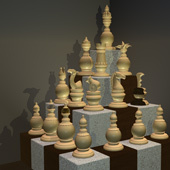 Captured pawns are taken from the board.